Victory For Freedom of Speech and Pro-Life Pregnancy Centers! In a resounding victory for freedom of speech, the U.S. Supreme Court ruled today that a California law forcing pregnancy resource centers to promote abortion is unconstitutional. However, the 5-4 ruling in NIFLA vs. Becerra is a chilling reminder of just how fragile our constitutional rights are at this point in our nation’s history. 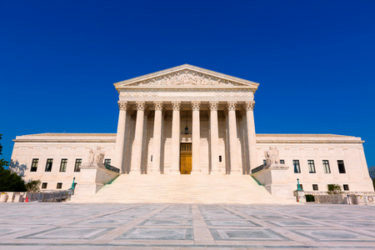 Justices writing for the majority delivered a stinging rebuke to the California State Legislature for enacting the FACT Act, which required only pro-life pregnancy care centers to post a long statement, written by the government, in their facilities and in all advertising. Justice Clarence Thomas, who wrote the majority opinion, forcefully refuted the State’s contention that the Act was not a violation of the First Amendment because it fell under the category of “professional speech.” He wrote, “regulating the content of professionals’ speech ‘pose[s] the inherent risk that the Government seeks not to advance a legitimate regulatory goal, but to suppress unpopular ideas or information.’” He continued to say that governments have historically used this manipulation “to increase state power and suppress minorities.” At that point, Thomas cited several examples of this, including a reference to Nazi Germany. Chief Justice Roberts and Justices Alito and Gorsuch joined Justice Kennedy in his concurring opinion. If you would like to read a version of the U.S. Supreme Court decision, which has been highlighted for easier reading by this author, please click here. You can find the un-highlighted opinion here. NC Family signed on to a “friend-of-the-court” brief for this case in January, urging the U.S. Supreme Court to support the free speech rights of the pro-life pregnancy centers. The amicus brief was filed on behalf of 41 family policy organizations and was authored by David French, a former ADF attorney and current Senior Fellow at the National Review Institute.